I know xantham gum is a fairly common ingredient these days, and it can even be bought in supermarkets, but when I bought this way back it was a speciality product which I was surprised to find in a local health shop. I probably bought it with lofty ideas of gluten free baking for my gluten intolerant Mother in Law but since she lived in Hawaii then and now lives in Mexico, this was never going to see much use. I wanted to use it at least once during MoFo but I didn’t want to add to my pantry woes by having to buy lots of other speciality flours to use with it. Yet another new cookbook came to my aid – Artisan Vegan Cheese. There has been lots written about this book recently but I’m not a very patient cook and haven’t got round to trying it yet. However, probably the easiest recipe in the book for a cheese sauce used optional xantham gum so I decided to give it a try. It really is very simple – there’s an option of soaking the cashews out on the counter to give a sharper taste to the sauce, which I did, and was astonished to see what a difference it made to the final sauce. The xantham gum definitely made a difference too – the sauce became meltier and stretchier after adding it. I used it today in a super quick lunch of a pitta bread spread with some olive paste, poured some sauce on, grilled it for a few minutes then scattered it with some fresh basil. Divine, and I’m using the leftovers tomorrow with another Mofo ingredient! Do you have any non baking ways with xantham gum? 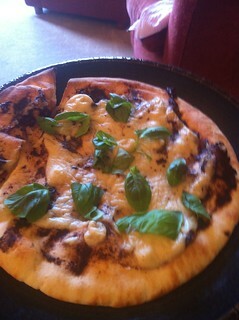 This entry was posted in Artisan Vegan Cheese, VeganMoFo 2012 by efcliz. Bookmark the permalink. Finally a use for that stuff! Someone gave me a bag of it ages ago and since I’m not into gluten-free baking, I had no idea what to do it it. Can’t wait to get a copy of that book, I’m hoping it will show up on my doorstep soon! I pretty much only use x gum for baking… but I DID recently buy this famous cheese book (and have yet to crack it open). 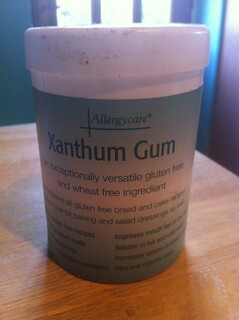 Good to know that I’ll have more uses for my xantham gum!